Curry has a history? I never gave that a thought until I stumbled upon Kari Ga, a wonderful chicken stew at Pho Quynh on Central Avenue. “Ga” means chicken and “kari” means — say it out loud — curry. That discovery led to a Charlotte food journey reaching back to ancient India. Vietnamese chicken curry, called Kari Ga, comes from ancient India. The bread along side is a legacy of French colonial days. Kari Ga tastes rich and comforting, with a coconut milk base and chunks of potato. Mrs. Nguyen chops chicken into small pieces, bones and all — which requires you to munch carefully, but the effort is worth it. 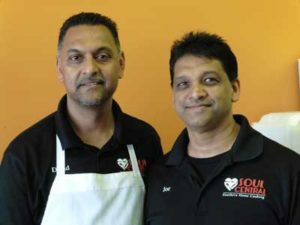 Manager David Ragoonath and owner Joe Mahaboob at Soul Central grew up in Indian families in Trinidad. 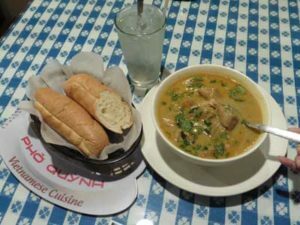 The next Saturday I wandered into Soul Central a few blocks down Central Avenue from Pho Quynh — and discovered curry again. 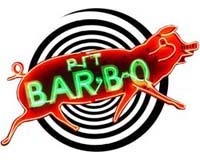 The restaurant’s mainstay is American soul food, including meatloaf and collard greens. But every Saturday there’s an added Curry Corner menu. 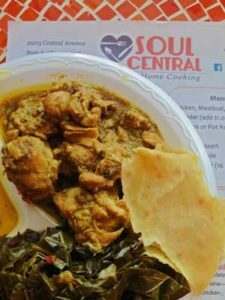 On Saturdays Soul Central serves chicken curry from India by way of Trinidad. Note the roti flatbread. So is curry Indian? Yes, confirms a Google search. Centuries ago, traders from India brought curry to Southeast Asia. More recently, Indian immigrants carried it halfway around the globe to Trinidad. For a taste-check, I visited Maharani, a longtime north Indian eatery on Kings Drive. Yep, their chicken curry has a lot in common with Soul Central’s. Indian curry with coconut milk was harder to find. Turns out it is south Indian. Coconut trees crowd India’s southern shores, where ancient traders sailed to what is now Vietnam. 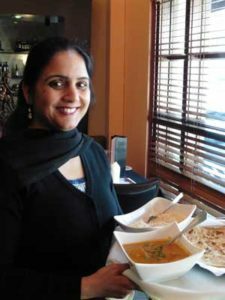 Mangeet Kaur, manager at Maharani Indian Cuisine, shows off north Indian chicken curry with roti. In the Charlotte area, Aroma Indian Cuisine near Concord Mills Mall features south Indian specialties, such as the rolled crepes called dosas. Jackpot! 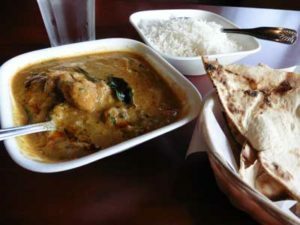 The Chicken Korma at Aroma looks a lot like the Kari Ga at Pho Quynh, with the sweet comfort of coconut milk playing off against the gentle spice of yellow curry. On the side? Roti, a flatbread, at Aroma and Maharani. Roti, a flatbread (though with a different texture) at Soul Central. At Pho Quynh, there’s bread, too — French bread dating to Vietnam’s French colonial era. 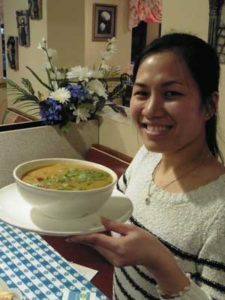 Quynh Phan serves Kari Ga at Pho Quynh Vietnamese Cuisine on Central Avenue. 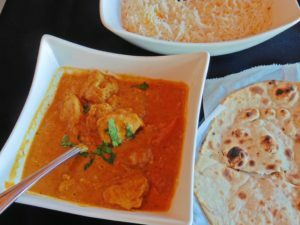 Monday – Saturday 10 a.m. – 10 p.m.
Murg (chicken) curry in the north Indian tradition, with roti bread on the side, at Maharani. Monday – Thursday 11:30 a.m. – 2:30 p.m., 5 p.m. – 10 p.m.
Friday 11:30 a.m. – 2:30 p.m., 5 p.m. – 11 p.m.
Saturday Noon – 3 p.m., 5 p.m. – 11 p.m.
Sunday Noon – 3 p.m., 5 p.m. – 10 p.m.
South Indian curry at Aroma Indian Cuisine uses a coconut milk base. Tuesday – Thursday 11:30 a.m. – 2:30 p.m., 5:30 p.m. – 9:30 p.m.
Saturday 11:30 a.m. – 3 p.m., 5:30 p.m. – 10:30 p.m.
Sunday 11:30 a.m. – 3 p.m., 5:30 p.m. – 9:30 p.m.